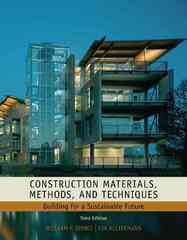 Construction Materials, Methods and Techniques 3 Edition Explore the most up-to-date green methods for residential and commercial building construction, along with the construction materials and properties needed to carry them out with this newly revised book. CONSTRUCTION MATERIALS, METHODS AND TECHNIQUES: BUILDING FOR A SUSTAINABLE FUTURE, 3E offers comprehensive coverage of these topics and presents them using a logical, well-structured format that follows the natural sequence of a construction project. With an emphasis in providing the most current information available, including sustainability and green design, this third edition is fully equipped with content that reflects the 2004 Edition of Construction Specifications Institute (CSI) MasterFormat and information that is based on the input of hundreds of today's top manufacturers and professional and trade organizations. In addition, relevant building codes are frequently referenced, rounding out this need-to-know coverage that is critical to success in the industry.